With the rising popularity of yoga and its controversies around its religious origins, Christians who are wanting to experience its benefits are often left wondering whether yoga is an activity they can participate or engage in. Having been at the forefront of this space in and being asked the same questions over, we've compiled a list of commonly asked questions. The answer to these questions come from our beliefs, understanding and experience, together with discernment from much prayer. Not everything in this world is absolute and we respect that not everyone agrees with our discerned perspective. However, we hope that these answers can help guide you in finding God's will for you with regards to this topic. May we all be faithful in serving our God according to His will, being the hands and feet of Jesus. 1Isn’t yoga an Eastern religious practice? With its earliest inscriptions originating from the Indus Valley over 5000 years ago, yoga definitely has deep and rich cultural roots from ancient Indian civilisation which later spread to the Far East. Acknowledging the many benefits of this ancient practice, yoga evolved into many different lineages and was adapted as a spiritual discipline by different religions. Without dishonouring its rich heritage, yoga’s many benefits continue to be recognised by modern western science and different cultures forming what is now the modern-day adaptation of yoga - arguably completely separable from any religion or adaptable by any religion as a spiritual practice. In its most neutral form, however, yoga consists of 3 key components: breath work, movement and meditation. 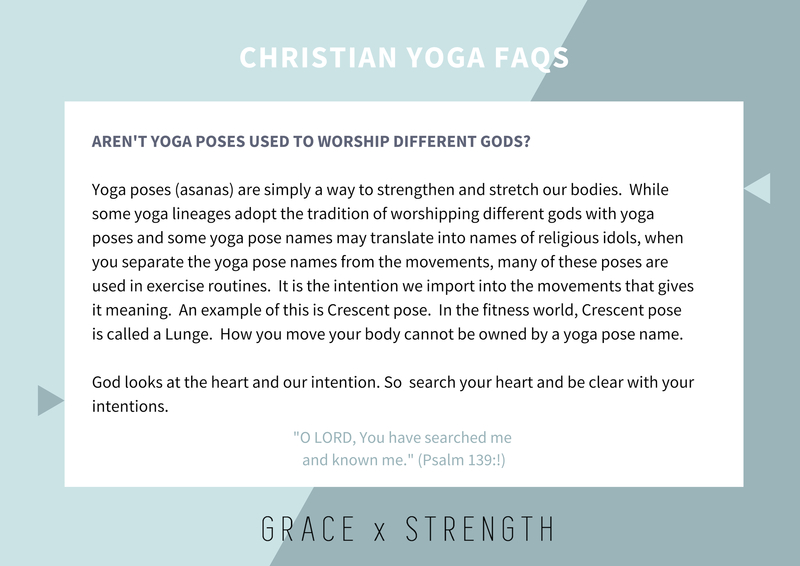 2Aren't yoga poses used to worship different gods? Yoga poses (asanas) are simply a way to strengthen and stretch our bodies. While some yoga lineages adopt the tradition of worshipping different gods with yoga poses and some yoga pose names may translate into names of religious idols, when you separate the yoga pose names from the movements, many of these poses are used in exercise routines. It is the intention we import into the movements that gives it meaning. An example of this is Crescent pose. In the fitness world, Crescent pose is called a Lunge. How you move your body cannot be owned by a yoga pose name. 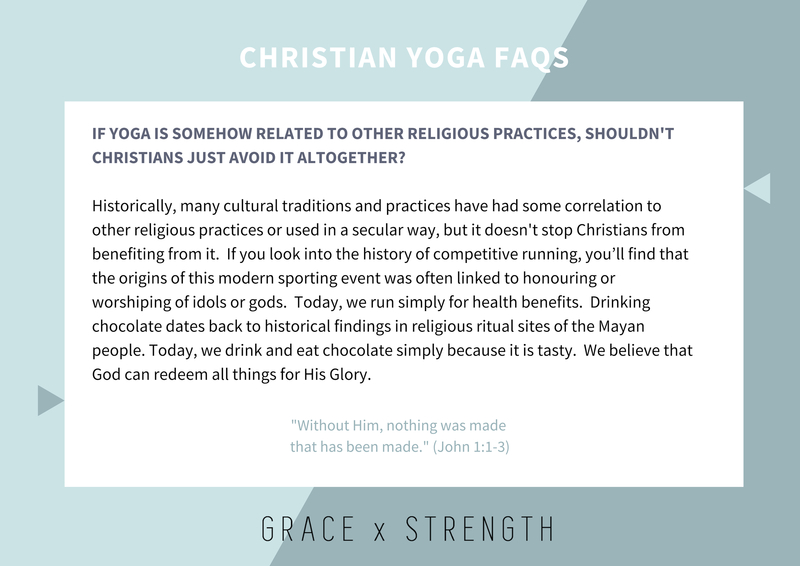 3If yoga is somehow related to other religious practices, shouldn’t Christians just avoid it altogether? 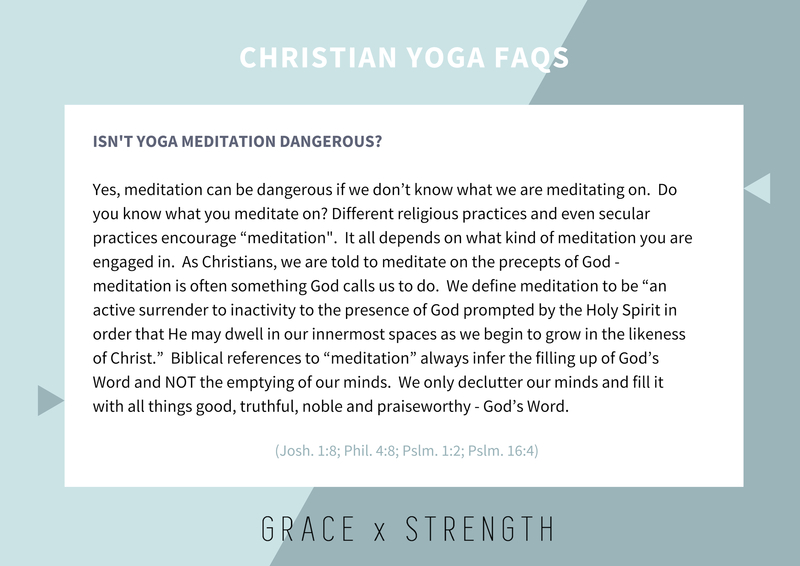 5Is there a risk that by saying “ YES" to Christian yoga, others might go and practise yoga in places that may lead them into meditation rooted in other philosophies or chant to other gods? In short, yoga might not be for everyone. We believe that it is always important to seek the Lord in prayer and ask for clarity. If it’s not for you and you find that it is stumbling for your faith, then by all means discontinue your practice. 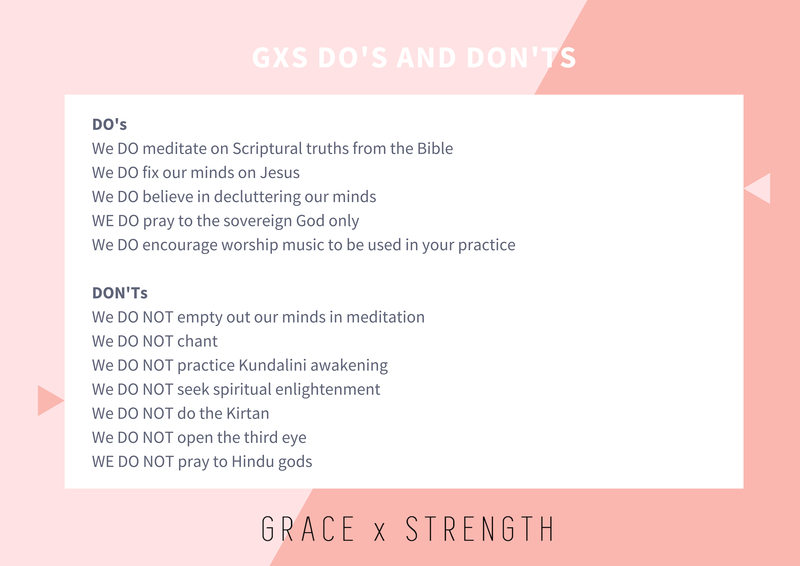 But if you, like us, find that the yoga practice benefits you physically, mentally and draws you closer to God and your relationship with Jesus grows because of it, then YES you should keep practising! Always pray about where you practise and with whom you practise with, just like you would with all things. 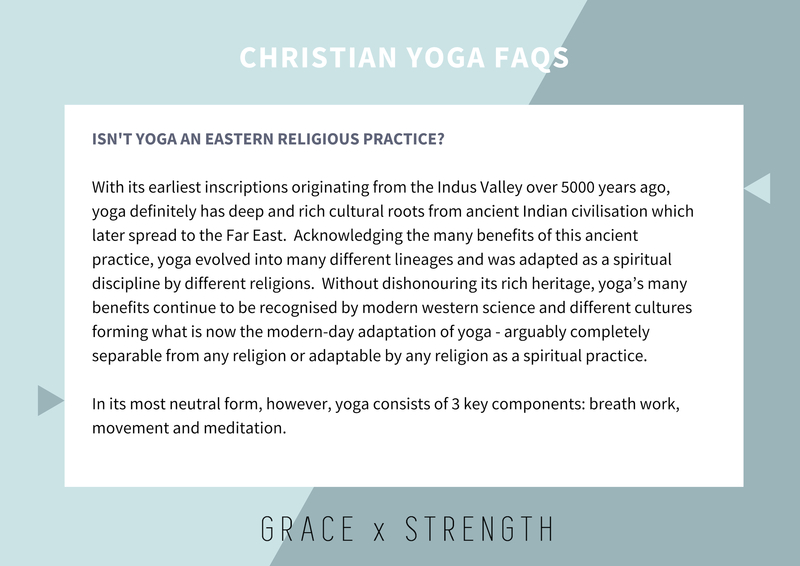 Isn’t yoga an Eastern religious practice? Aren’t yoga poses used to workshop different gods? 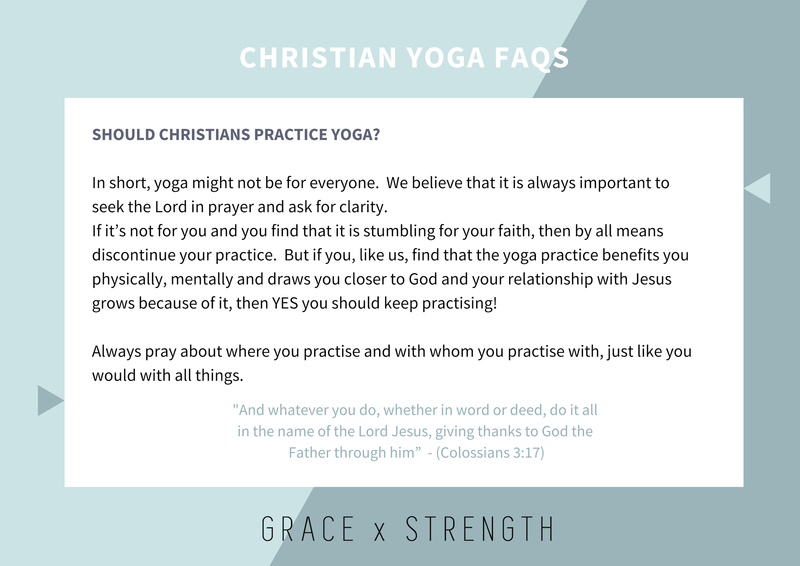 If yoga is related to other religious practices, shouldn’t Christians just avoid it altogether? 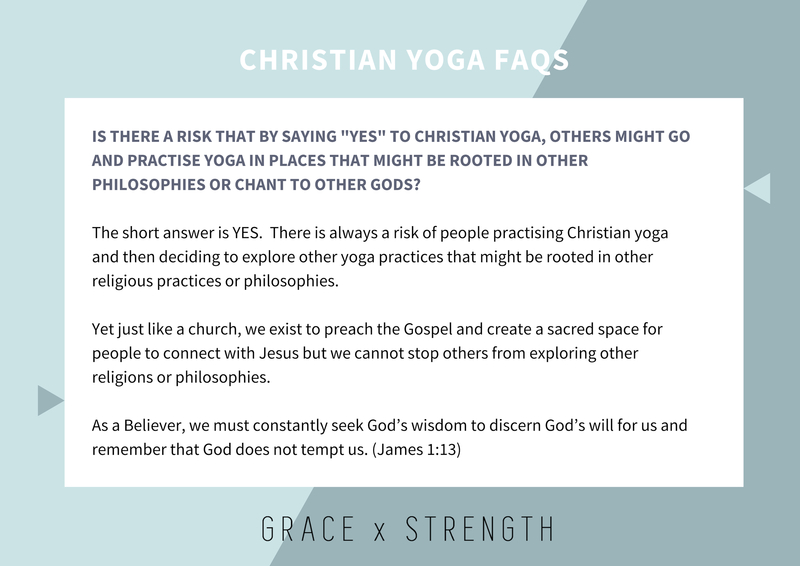 Is there a risk that by saying ‘yes’ to Christian Yoga, others might go and practise in places that might be rooted in other philosophies or chant to other gods?